Synopsis: This is a fairy tale that gives zero F's. 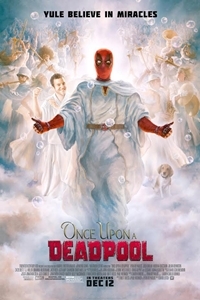 To kick off the holidays, Twentieth Century Fox presents ONCE UPON A DEADPOOL. The originally R-rated DEADPOOL 2 has been revamped, renamed and re-released in theaters for a limited run with a PG-13 rating. The only f-word in this film is Family. Fred Savage will join Reynolds in new added scenes for ONCE UPON A DEADPOOL as an obvious nod to Savage's starring role in the 1987 bedtime-story classic THE PRINCESS BRIDE. Fred remarked, "while my participation in this film was anything but voluntary, I am happy to learn that Fudge Cancer will be the beneficiary of this shameless cash grab."